AMC Conditions: Hiking around Cardigan Lodge! View from South Peak-Rimrock to Mt. Gilman. Photo by Peter K.
Photo of Mt. Cardigan from the Lodge. 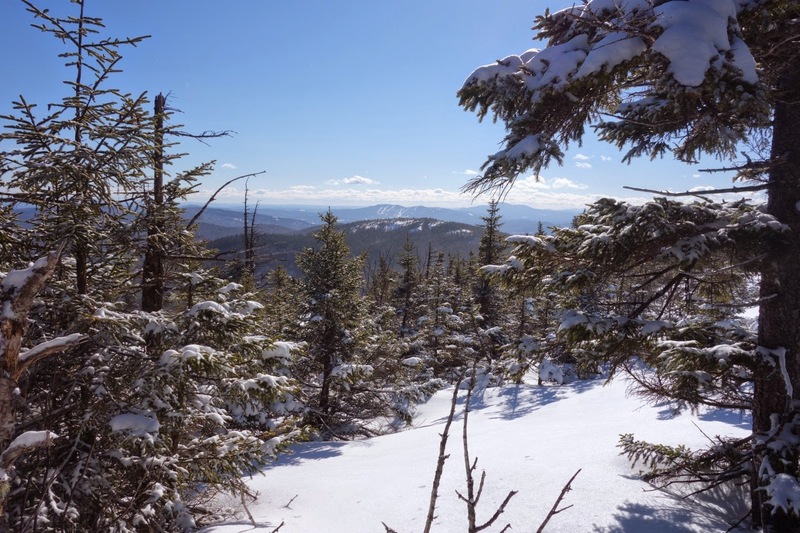 Photo by Peter K.
A great mix of hiking and ski trails makes Cardigan a popular destination for winter sports and outdoors enthusiasts! With over three feet of snow covering the upper and lower trails, downhill and cross country skiers report great conditions. Most hikers are using snow shoes to get around the trails, and traction is recommended for the summit of Mt. Cardigan . . . where the wind has blown most of the snow away and icy patches prevail. As March arrives, with its extra hours of daylight, more hikers may want to bag the five peaks at Cardigan. 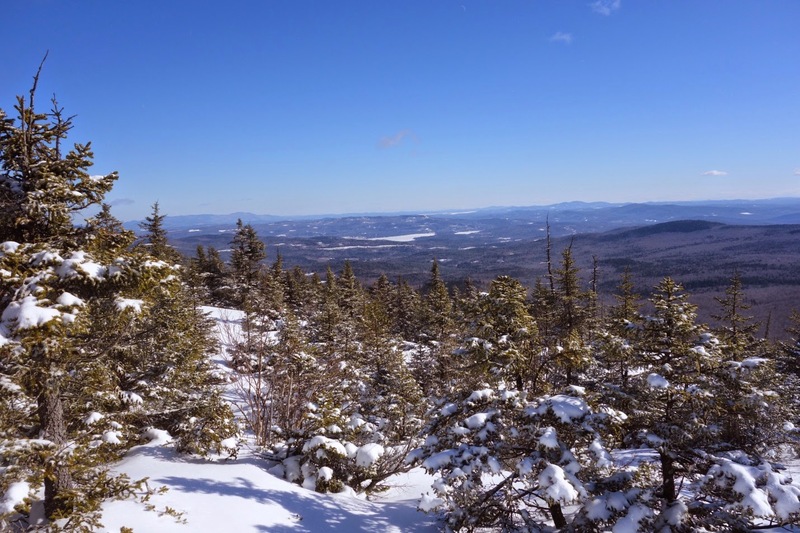 We have a great loop trail that takes you over Firescrew, Cardigan, South Peak, Rimrock, and Mt. Gilman (Orange). This loop covers about 7½ miles. The great thing about Cardigan is that you can choose an itinerary that works for you . . . long or short . . . with 200 to 2,000 feet of elevation gain/loss. Over the past few weeks I’ve had a chance to hit all our peaks, plus take a trip to Welton Falls. View of Cardigan from Firescrew. Photo by Peter K.
Many hikes start on the Holt Trail to Grand Junction, which is just over a mile from the lodge, with only a couple hundred feet of elevation gain (so, another option for those who want a beautiful walk in the woods along Bailey Brook that’s not too strenuous). Last weekend, from Grand Junction, I headed up Vistamont Trail toward Mt. Gilman with a couple friends. The snow was deep and we got to break trail in snow shoes . . . getting a great workout as we dropped down to a frozen brook crossing and then trekked steeply (600 feet of elevation in a quarter mile) toward Mt. Gilman. Atop Mt. Gilman there are great vantage points for views to the north and east. A couple weeks back, I did the Firescrew-Cardigan loop . . . about 5 ½ miles. My preference is to go up Manning to Firescrew, then over to Caridgan, and back down via the Clark Trail to the Holt-Clark Cutoff. You get great views of Cardigan as you climb up Manning and from atop Firescrew. I always encourage folks to take a slight detour whether they’re heading up or down from Cardigan, to catch South Peak and Rimrock (as well as AMC’s High Cabin . . . our popular mountainside hideaway that sleeps 12). 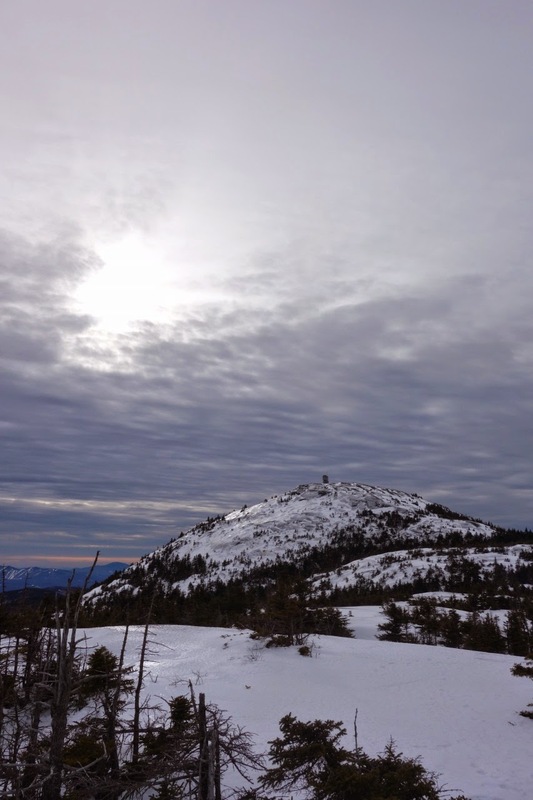 You can add these two summits to your list of accomplishments in less than a mile without much elevation change. And, you can get great views (notice a theme about Cardigan?)! View from Mt. Gilman. Photo by Peter K.
While I have not been bitten by the back country ski bug yet, it’s great to see skiers on the trails skinning up. A lot of our ski and hiking trails intersect, and it’s always fun to catch a glimpse of a skier shooting through the trees . . . they sure do make it back down faster than hikers! If going up the mountain isn’t your cup of tea, there are great trails all around the lodge. The Upper and Lower Nature Trails are popular, and you can even hike across a frozen river to reach a frozen water fall. I took a stroll on snow shoes to Welton Falls recently. It’s well worth the 3 mile roundtrip. 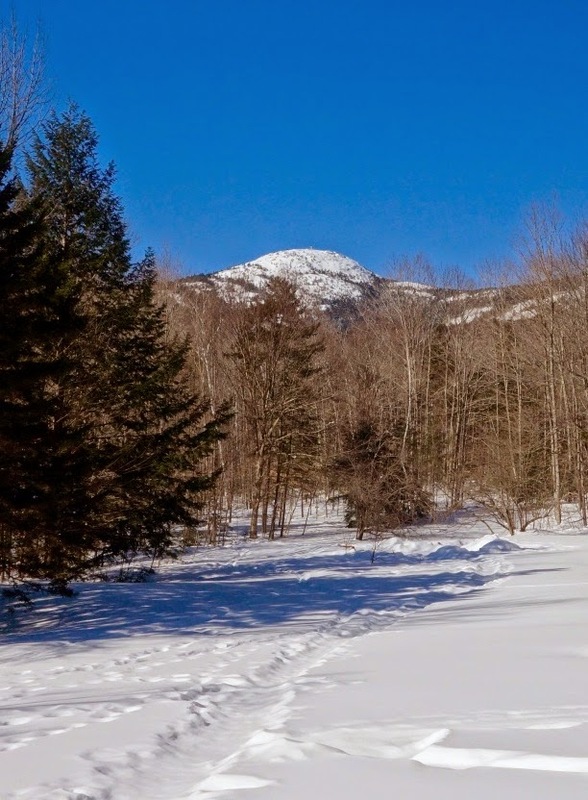 It’s hard not to find the perfect trail and trip at Cardigan, whether hiking, skiing, or snow shoeing. We’re always ready to discuss and offer suggestions to our guests and day visitors who stop in at the lodge. Spring is coming, but there’s still plenty of winter fun to experience at Cardigan! The AMC also offers classes and chapter trips for ice climbing, skiing, snowshoeing winter mountaineering and avalanche classes. All of our programs for the '14/'15 season can be found on our Activities and Events Page. For any general questions, conditions information, or trail advice, please feel free to contact us here at the Pinkham Notch Visitor Center front desk. We are available by phone at (603) 466-2721 every day from 6:30 AM to 9:00 PM or by email at amcpinkhaminfo@outdoors.org. To make reservations at AMC Lodges and Huts, please call (603)466-2727 available Monday through Saturday 9am-5pm.